In its latest annual Temasek Review, Temasek Holdings (Private) Limited set out how it protects its past reserves. "As a Fifth Schedule entity, our Board has a responsibility to protect our Company’s past reserves. This includes ensuring that every disposal of investment is transacted at fair market value. "Our Board and CEO have a duty to seek approval from the President before any draw occurs on our Company’s past reserves. "There is no draw on past reserves as long as our total reserves equal or exceed our past reserves. "Mark to market declines on existing investments would not be a draw on past reserves. Similarly, a realised loss on disposal of an investment would not constitute a draw on past reserves, as long as the disposal was done at fair market value." 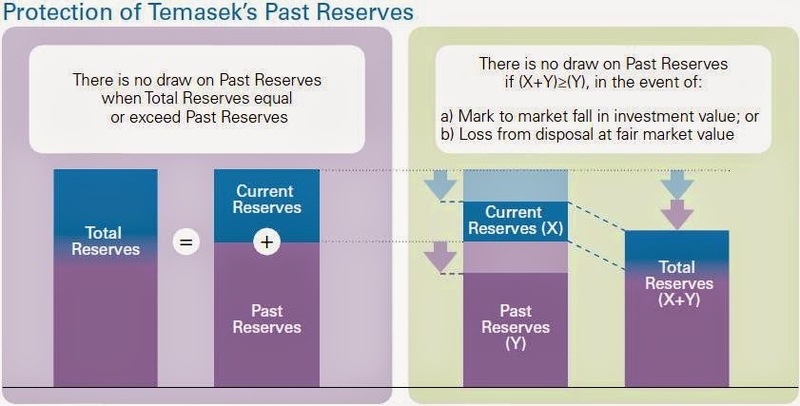 Temasek says that there is no draw on past reserves as long as its total reserves equal or exceed its past reserves. This may not necessarily be true if there is an increase in share capital through a new share issue by Temasek. Temasek says that mark-to-market declines on existing investments are not a draw on past reserves. Neither does a realised loss on disposal of an investment constitute a draw on past reserves, as long as the disposal was done at fair market value. If neither mark-to-mark declines on existing investments nor realised losses on disposal of investments not constitute draws on past reserves, what situations will constitute draws on past reserves? Or, does Temasek mean that mark-to-market declines and/or realised losses do not constitute draws on past reserves provided total reserves (excluding any new capital) are not less than past reserves? The President has an independent custodial role in safeguarding the separate past reserves of the Government and the Fifth Schedule entities such as Temasek. Temasek says it has a duty to seek approval from the President before any draw occurs on its past reserves. What can the President say or do if Temasek informs him there has been or will be a draw on its past reserves (except for a voluntary draw on past reserves)? Mark-to-market declines are just that — mark-to-market declines. Not only are they after the fact, but they are market-driven. Realised losses on disposal of investments, even if done at fair market value, are also after the fact. When faced with a potential draw on its past reserves due to mark-to-market declines and/or realised losses on disposal of investments, what can Temasek do? It can reduce its expenses, especially the bonuses of its staff. It can postpone the disposal of privately held investments that will result in realised losses. It can bring forward the disposal of its privately held investments that will result in realised gains. Temasek should preserve its past reserves to the extent possible and practicable. But, it makes little sense either to postpone the disposal of privately held investments that are fully valued and/or have reached the peak of their potential in the investment horizon; or to bring forward the disposal of privately held investments that are undervalued and/or are yet (but likely) to reach their potential in the investment horizon, just so that past reserves are not drawn on. 1. The Fifth Schedule of the Constitution of the Republic of Singapore. 2. Temasek defines fair market value as the price agreed on an arm’s length basis between a willing buyer and a willing seller. 3. Apart from available-for-sale financial assets, privately held investments appear to be held in Temasek's financial statements (which the group financial summary in Temasek Review 2014 is supposed to represent) at Temasek's share of the investee companies' shareholder equity. Prior to the financial year ended 31 March 2006, long-term investments were stated at cost less allowance for diminution in value. With the introduction of FRS39 Financial Instruments: Recognition and Measurement during the financial year ended 31 March 2006, available-for-sale financial assets were required to be measured at fair value. At each reporting date, such assets are re-measured at their fair value. Changes in fair value, other than impairment losses, are recognised in other comprehensive income and presented in the fair value reserve in equity until such assets are disposed of. Impairment losses are recognised in the income statement.